A I saw this clever drinks locker on a Tradewind 35. It was designed from scratch, and the idea could be applied to the area over the foot of many bunks to provide extra stowage space. The bottle heights are accommodated by having the bases go below table level, while the tops go up into a deep, boxed lid. 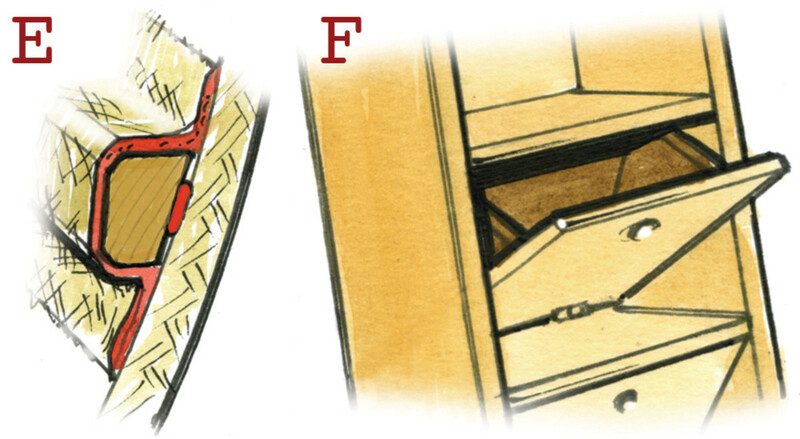 The two-part lid has two handy troughs when open and hinges down to form a flush-fitting locker top.B The bunk length is maintained by your feet going into a trotter box—which is also a handy place to stow bedding. 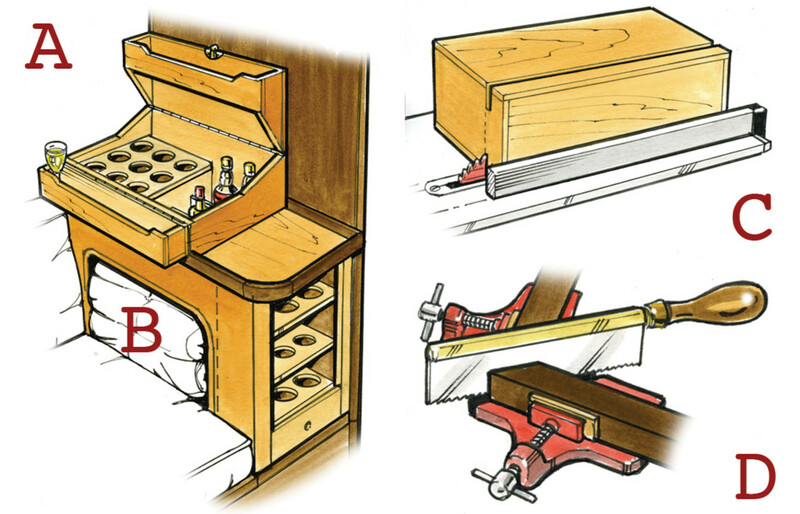 A glasses rack takes up the thin outside edge space.C An easy way to make boxes with lids that fit perfectly is to make a solid box and then saw the lid off with a fine-blade circular saw. Remember not to cut through nails or screws.D If you frame lockers with mitered joints and they are not perfect, grip them in a miter clamp and run a thin-bladed saw through to true up the joint. E When adding lockers to a fiberglass boat, the outer edges can be screwed to a wooden batten fixed to the hull with resin and mat. Knock the corners off the batten so the glass drapes better, and temporarily hold the batten in position with blobs from a glue gun or skirting-board glue. Then place a few layers of mat over it. Epoxy works best, but I’ve also used cheaper polyester. F Handy lockers can be fitted into awkward spaces. Foldout troughs under companionway steps make good homes for small stuff. G Under-bunk lockers can be divided up like this: top access for flat clothes and side-access for a specially shaped bin that makes a good base for cheaper plastic boxes and bread trays. Color-coding might help you find stuff.H A “train” of plastic boxes or baskets joined by line can be pushed into awkward spaces, like unused quarterberths. Numbers will help identify the contents if they are logged in a book.